I read this book in college and recently picked up its revised second edition. 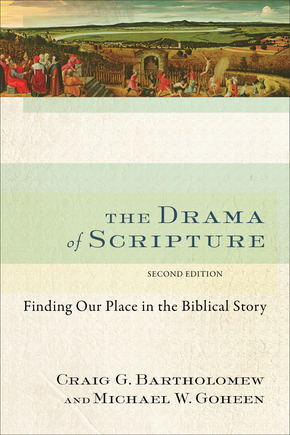 It’s an excellent book that, as the subtitle states, is about helping Christians find their place in the biblical story. The authors present a very thorough biblical worldview—from creation to sin to restoration. In this task they excel superbly. They show how God created everything with order, goodness, and beauty. Man, though created by God in his image (“God makes a finite and creaturely ‘stamp’ of himself”) willfully rebelled and thus ushered in sin and death. In contrast to this Christian worldview, they present the “Western story” that has so shaped our society in various ways throughout the centuries. The roots of the Western worldview were thoroughly pagan; and the puzzling thing is that the gospel was introduced in this culture. While there is great danger in this cultural accommodation, there is also the great potential for “faithful contextualizations” of the gospel message. Every culture faces this sobering dilemma; and yet there is no escape. The great wonder is that the gospel is transcultural; it does not need a specific culture to thrive, but so engages and adapts in any culture. The interesting observation is the degree to which the Western worldview has been influenced and indeed enriched by the Christian worldview. As mentioned above, the inescapable danger is of so adapting to a culture that one loses any distinctive mark of Christianity. What Goheen and Bartholomew attempt to do, is to trace each of the historical periods, analyze their particular strengths and even their weakness, and also examine how the church reacted to it, where faithfully or not. Doing this well helps us be faithful in our day. The reader must come to grips with the fact that while there are many noble aspects to affirm in the various competing worldviews, there still remains the inconsistent, self-contradictory, and indeed damaging implications of these worldviews. For example, Romantic humanism rightly saw the incongruities with the Enlightenment and therefore reacted against the Enlightenment’s outward engagement by turning inward (human emotion, imagination, creativity, and instinct). As Christians, we can affirm the honest, level-headed critique of the naïve optimism of the Enlightenment with the messianic hope in liberalism/Marxism, and even the acknowledgement of the “darker side” of the human heart. Yet, Christians must jettison the notion that answers to life ultimately lie with the self, with the ever-changing subjective inclinations of the human heart. The implications of the authors’ arguments are great. Again, one’s worldview shapes every facet of life—nothing is left unchecked. For the Christian, then, our acceptance of the Christian worldview directly informs and guides how we operate a business, or involve ourselves in politics, or engage in sports, or perform music, or contribute to scholarship, or serve in education. These are but a few areas of contemporary life that the authors expound upon. The beauty of it all it in seeing how the gospel intersects every dimension of life. As Christians, we do not—or should not—operate with a compartmentalized gospel. This book serves as a great guide for Christians to biblically and critically think on how best to serve God with the limited time each of us has in this life. While the church could easily become ingrown in order to maintain a semblance of fidelity, the need of the hour is for the church is to not only shine on Sunday mornings, but as Christians scatter in their spheres of influence Monday through Friday they can be clear witnesses of gospel-saturated lives. That said, are there any weaknesses? Where the authors get the larger metanarrative right, I believe they miss out some of the particulars of the true mission of the church. Absent from the discussion is the need to evangelize and calls others to trust in Christ. Heavily indebted to N.T. Wright, there is great emphasis on the Lordship of Christ over the totality of life, but as John Piper has noted, how is Christ’s lordship any good to one who is not reconciled to him by faith. Therefore we must call others to turn from sin and toward Christ, not just be part of his story. Is Herman Bavinck Relevant Today?